Squatting inside the tomb, this is how a group of archaeologists from the Egyptian Ministry of Antiquities has discovered the last historical discovery in front of the mysterious pyramid of Meidum: the skeleton of a girl. Apparently, the remains were buried in a cemetery located next to the pyramid. Archaeologists calculated the age of the girl's death, about 13 years old, by examining her bones. It is not clear when it was buried, although the pyramid of Meidum dates back to about 4,600 years. In addition, the tomb was empty, without goods or others to analyze, except for the body. The discovery comes the same week that archaeologists found in the same cemetery two heads of animals, probably bulls, buried next to three small pottery vessels. The heads and vessels of the animals were probably conceived as funeral offerings, although the investigators are not sure of which funeral they went to. Remains of a brick wall that may have surrounded the cemetery were also found. The pyramid of Meidum was initially constructed as a step pyramid (an architectural structure constructed by overlapping, overlapping, deformed platforms, like steps or bleachers, to achieve a shape similar to a pyramid) before becoming a true pyramid, with smooth surfaces in Rungs place. It is also not clear why it was converted from a staggered to a true pyramid. Archaeologists believe that at least part of the pyramid was built for Pharaoh Snefru, also called Sneferu, (who reigned from about 2575 to 2551 BC). 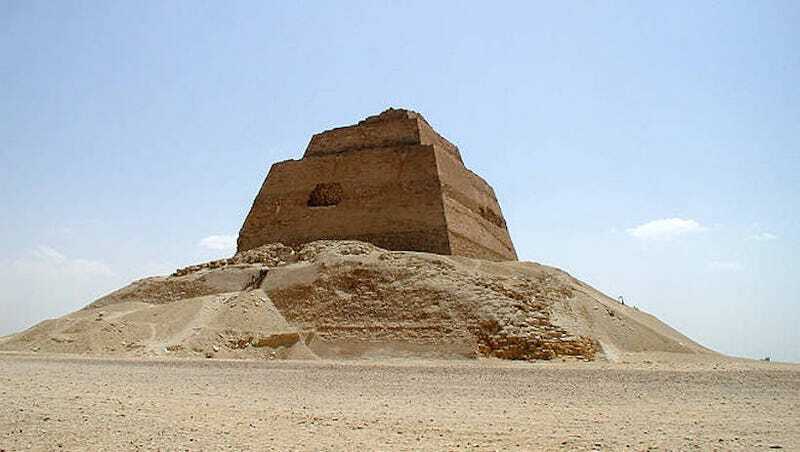 The predecessor of Snefru, Pharaoh Huni, originally built it as a staggered and then Snefru turned it into a true pyramid.